If you’ve crossed off the World of Coke, the Varsity, the High, and all of the other classic Atlanta stops from your list, it’s time to head to some of the city’s lesser-known destinations. While the “tourist traps” have their charms, small, local stops showcase the city’s more niche industries. More often than not, these spots are far less crowded than the more famous attractions. If you’re coming in with a group, Falcon Charter Bus can help streamline all of your transportation, allowing you to travel with ease to every stop on your itinerary. Whether you’re coming in on a personal vacation, looking to fill time during your business event, or planning an outing for a retirement community, we’ll find the perfect bus to ensure a comfortable trip for your group. 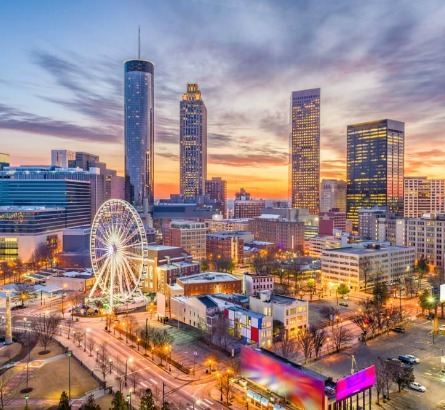 We looked at some past trips we’ve booked for Atlanta travelers and compiled some of their favorite “off-the-beaten-path” stops, from hotels to attractions to restaurants. Below is a sample 2-day itinerary recommended for the “been there, done that” crowd. Use these recommendations to plan your trip or build your own itinerary based on what you want to see. Either way, we’ll make sure you travel in style to every stop, always operating on your schedule. Try a local bed & breakfast as opposed to a chain hotel for your next Atlanta stay. Offering a more “homey” feel and often an interesting backstory, a B&B is a great way to experience Atlanta like a local. Plus, the owners will be able to give you recommendations on the neighborhood’s best restaurants, activities, and more! Known for its beautiful gardens that have been blossoming across the grounds since its opening in 1996, the Virginia Highland Bed & Breakfast is a beautiful place to settle in after a long day of exploring the city. The location was even named an Audubon Wildlife Sanctuary in 2006. Formerly a working farm home to a family of 15, The Social Goat is a charming ¾-acre complex with a variety of suites to choose from. Guests can socialize with the owners’ goats, turkeys, chickens, and ducks in between visits to local attractions, many of which are just a few miles from the inn. This Queen Anne Victorian-style home sits in Atlanta’s historic Inman Park. The home has been fully restored to preserve the original architecture and details, making it a charming temporary home to return to after a day of exploring the city. The owner is even known to occasionally perform a quick jazz piano concert for guests in the living room. Public services such as rideshare apps or MARTA may separate your group or operate on fixed schedules, and they offer a less private traveling experience. With a private bus at your disposal, your group can enjoy personalized amenities and a driver who will travel according to your specific schedule, leaving every aspect of your trip totally within your control. When you call to book with Falcon Charter Bus, we’ll find the best bus for your group’s specific needs. With full-sized coaches, minibuses, and multiple models in between outfitted with air conditioning, WiFi, extra luggage space, and more, we’re sure to find the most comfortable travel arrangement for everyone in your group. Okay, we know you’ve probably been to a show at the Fox, but have you ever taken a tour of this historic theatre? On Mondays, Thursdays, and Saturdays, the Fox opens its doors to curious visitors who wish to learn more of the building’s history, dating all the way back to 1929. Specialty tours are even offered during certain seasons. Browse produce, meats, baked goods, coffee, flowers, and more from local businesses from all over Atlanta at the city’s oldest market, dating back to 1918. After browsing, enjoy lunch at one of the market’s permanent eateries, featuring all types of unique cuisines. Though it often receives less attention than Sweetwater or TorchedHop, Scofflaw offers its own selection of six unique brews in an open and communal setting. Tables are available to relax and converse while you taste-test and enjoy your evening. One of only two Porsche Experience Centers in the country, this facility offers the rare opportunity to either take a private driving lesson or ride shotgun with a pro in a Porsche. Tours and simulator experiences are also available, making this a thrilling stop for visitors of all ages. The Museum of Design Atlanta is the only museum in the Southeast devoted to all things design. Though it is often overlooked by the High, the MODA offers unique exhibits centered around the ways in which design affects our daily lives. A cozy bar disguised as a “church,” Sister Louisa’s is known for their signature sangria and eclectic folk art adorning the walls. Recurring events include church-organ karaoke and ping-pong tournaments. No, it isn’t just another Chick-fil-A-- though you can’t visit the Southeast without ordering one of the food chain’s classic chicken sandwiches. Hapeville’s Dwarf House is world’s very first Chick-fil-A and features a full menu filled with the classic chicken meals you love plus other Southern specialties. With close proximity to the airport, it’s a perfect comfort food stop to visit after a long flight. Not your average doughnut shop, Sublime features flavors such as “sweet potato cake,” and is known for their rich and delicious doughnuts topped with candy bars or cereal. In the summer, they’re even known to serve doughnut ice cream sandwiches. After being open for just a few years, USA Today named Bell Street Burritos among the top 10 burrito restaurants in the country. Come see for yourself during your visit to Sweet Auburn Curb Market or at their Midtown or Inma Park locations. Use our recommendations as a reference or plan your own Atlanta adventure. Whichever you choose, you’ll be in complete control of your trip when you book with Falcon Charter Bus. Send us your itinerary and we’ll pair you with a driver (or group of drivers) who will ensure that you travel efficiently to every stop on your itinerary. We’re here to make your travels as smooth as possible, no matter your group’s needs. Give us a call today at 404-400-3545 to get started on your trip and secure the perfect bus rental for your group!